Be the first to review this 2019 Chrysler Pacifica. The Chrysler Pacifica emerged as a 2017 model, at a time when other manufacturers had abandoned or cut back on minivans. It proved to be time and money well-spent: Handsome looks and refinement placed the Pacifica near, if not ahead of, the family-van pack. Chrysler has made several revisions for the 2019 model year. A new "S" Appearance Package with black accents and wheels is available on Hybrid models. New 17-inch wheels are now standard on Touring L Plus and Hybrid Limited trim levels. LX trim gains automatic headlights. Several models add a heated steering wheel. Six gas-engine trim levels are offered: L, LX, Touring, Touring L, Touring L Plus, and Limited. Hybrid-powertrain models come in three trim levels. Lighter in weight and more efficient than it used to be, Chrysler’s 3.6-liter V-6 develops 287 horsepower and 262 pound-feet of torque, driving a 9-speed automatic transmission. All Pacificas have front-wheel drive. Under Hybrid hoods, the 3.6-liter V-6 mates with electric motors, making up the gasoline/electric powertrain that includes an electrically-variable transmission. Hybrid Pacificas are rated at 82 MPGe (gas-mileage equivalent) running on electricity alone. They can travel up to 32 miles on battery power, when recharged via a plug. Chrysler offers plenty of individual options for specific models. They include 20-speaker Harman Kardon audio, a surround-view camera system, and a tow package. Also available on certain trim levels are such active-safety features as adaptive cruise control and forward-collision warnings with automatic emergency braking. Blind-spot monitors and rear parking sensors are standard. The Insurance Institute for Highway Safety gave the 2019 Pacifica “Good” ratings in each test, except for the small-overlap crash on the passenger side, which was judged “Acceptable.” Frontal collision prevention is rated “Superior,” as long as optional safety technology is installed. Ease of child-seat use is deemed “Marginal.” The 2019 Pacifica earned a Top Safety Pick designation. Five-star crash-test ratings were issued by the National Highway Traffic Safety Administration, overall as well as for front and side impacts. Only in rollover prevention was a four-star rating issued. But that’s a calculated figure, and tall vehicles typically get four stars. 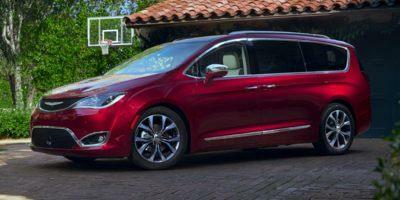 The 2019 Chrysler Pacifica L ($26,985), the base model, has a 3.6-liter gasoline engine and front-wheel drive. Standard features include cloth upholstery, third-row fold-away seating, a 7.0-inch touchscreen with Apple CarPlay and Android Auto, Bluetooth, 17-inch wheels, blind-spot monitors, and rear parking sensors. Base models seat eight, with a second-row bench. The LX ($29,795) substitutes second-row bucket seats for seven-passenger capacity, adding a power passenger seat and overhead console. The Touring Plus ($33,245) includes passive keyless entry, power sliding side doors and liftgate, and satellite radio. The Touring L ($36,545) features leather-trimmed seats, heated front seats, heated steering wheel, and a chromed roof rack. The Touring L Plus ($39,395) comes with a 7.0-inch driver information display, 8.4-inch touchscreen, heated front and second-row seats, and 13-speaker Alpine audio. The Limited ($44,445) gets hands-free sliding doors and liftgate, tri-pane panoramic sunroof, 18-inch wheels, HD radio, navigation, nappa leather-trimmed seats, second- and third-row fold-away seating, and an in-van vacuum. The Hybrid Touring Plus ($39,995) comes with a 7.0-inch driver’s display, blind-spot monitors, and power sliding side doors. The Hybrid Touring L ($42,195) includes heated front seats, perforated leather upholstery, and a power liftgate. The Hybrid Limited ($45,545) adds nappa leather-trimmed seats, hands-free power sliding doors and liftgate, and heated steering wheel. The Pacifica raised the minivan styling bar considerably. Sleekly attractive, the design almost conceals its utilitarian underpinnings. Most notably, the Pacifica manages to appeal even to families that gave up on minivans years ago. Standing apart from rivals when viewed from any angle, it’s one of the best-looking minivans available. To develop the smoothly-shaped body, designers began with the familiar minivan foundation, but added curvy sheetmetal and plenty of glass. Concealing the sliding door tracks beneath the back windows adds to the clean profile. Tucked-in front pillars and a continuous back glass panel help the Pacific appear smaller than its dimensions suggest. Within the comfortable, carefully-designed cabin, even the smallest details are deliberately positioned. Attention to detail shines brightly with such touches as metallic steering-wheel trim. No other vehicle matches the Pacifica’s seating configurations. Fold-away seats dubbed Stow ‘n Go are offered in the second and third rows on certain models. Though not as comfortable as some non-folding seats, the second-row Stow ‘n Go seats add utility and are easy to use. The third row is spacious enough for adults, providing adequate support. Power-recline and power fold-away third-row seats are optional on some trim levels. With a width of 79.6 inches, and a 121.6-inch wheelbase, the Pacifica makes good use of every inch of space. When the second- and third-row seats are folded down and out of the way, interior volume totals 140.5 cubic feet. With seatbacks upright, volume behind the third row amounts to 32.3 cubic feet. Abundant glass provides a wide-open view ahead. Passengers benefit from deep console bins, plentiful door storage, and a wealth of cubbies. The 2019 Pacifica meets a high bar for ride quality and powertrain performance. With 287 horsepower turning the front wheels, the V-6 delivers smooth acceleration with avid punch. The 9-speed automatic is much smoother in the Pacifica than in other Chrysler vehicles, with less jerkiness between some gears. The rotary gear selector includes an ΓÇ£LΓÇ¥ position that can assist with low-speed cornering and towing tasks. Handling comes close to sporty ΓÇô a joining of words that’s rarely been applied to a minivan. Solid ride and handling fare well against the competition, though Honda’s Odyssey feels a bit more crisp. Under nearly any road conditions, the Pacifica remains comfortably composed. On curvy roads, the Pacific is nimble for its size, even fun to drive. Its electric power steering setup feels almost like a sedan’s, and that helps minimize impacts from flawed pavement surfaces. Gas-engine Pacificas are reasonably frugal, EPA-rated at 18/28 mpg City/Highway, or 22 mpg Combined. The Pacifica Hybrid is among the most fuel-efficient minivans to be found. Well-equipped in each trim level, the 2019 Chrysler Pacifica is more comfortable and flexible than any competitor. In terms of utility, the Pacifica beats the popular Odyssey and Sienna. The Pacifica has become the benchmark against which other family wagons are measured.